Watering the garden can be a tedious task when you are busy handling other stuff like take care of kids, handling job and other chores of life. While having a flourishing garden at the back of home seems to be a bliss on sunny days, maintain it’s beauty can be a task. Instead of spending hours on watering every corner of the garden, use a tripod sprinkler which scatters the water in a uniform way, save your time, and efforts. 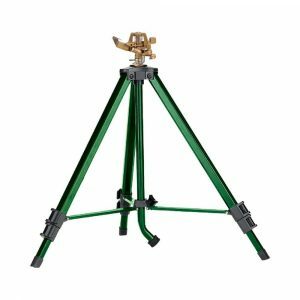 If you are looking for good tripod sprinkler, then continue reading the article which shows the top five tripod lawn sprinkler available on the market. One of the latest tripod sprinkler available online is the Orbit 56667N Zinc Impact sprinkler that can spray the water around 80 ft. in diameter in a circle. This sprinkler comes with a tripod base with an adjustable height between 16 in. to 37 ½. All you need is connect the garden hose to the gooseneck attachment and set the sprinkler right middle of the garden to water every corner of the land. The Orbit Zinc Impact Tripod Sprinkler is ideal for watering large gardens. The sprinkler head is adjustable and sprays water in partial to full circle. 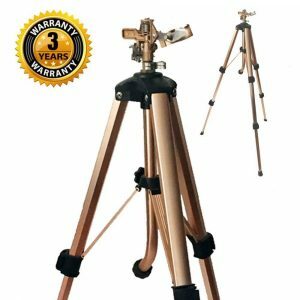 Tripod height can be adjusted from 16 inches to 37.5 inches in height where the water can be sprayed to the distance of 80 feet. Next in line for tripod lawn sprinkler is from the brand SOMMERLAND which is made using heavy duty brass that lasts long. This sprinkler can spray water in a 5000 sqft area and can be turned to 360 degrees so water can be diffused even in the corners of the land. SOMMERLAND Tripod sprinkler is manufactured with heavy duty brass. It can spray water up to 5000 square feet area. 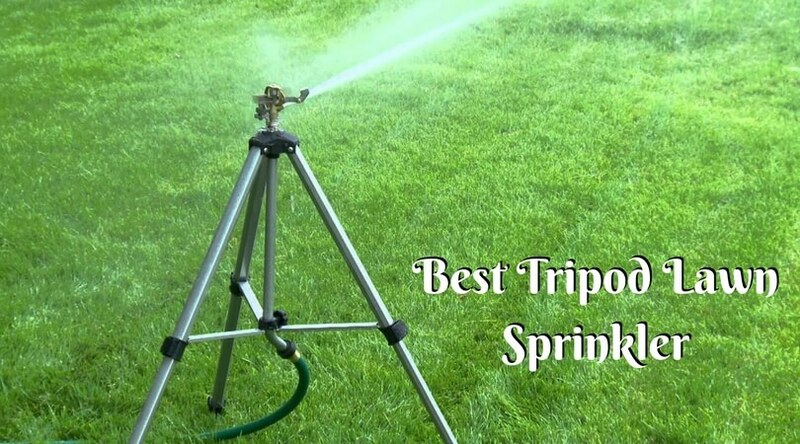 If you are looking for a tripod sprinkler for larger space, then go for the Gilmour 199TRI1 that promises to sprinkle water in 8500 square feet area. This 58 inches’ feet sprinkler has an adjustable collar for scattering the water in half or full circle. Easy to use, the Gilmour extra-large sprinkler is for those who have a duty to water bigger land. 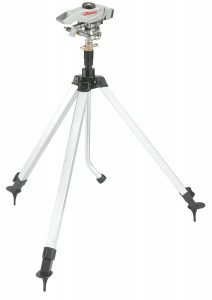 The feet of the tripod can reach up to 58 inches and collar can be adjusted from partial to full circle coverage. Dials can be customized easily to adjust the length of spray. Does watering huge lawn area seems like a task to you? MELNOR tripod lawn sprinkler is designed to water a larger area. The pulsating metal sprinkler has a durable construction and smart design that water around 55’ diameter. MELNOR tripod lawn sprinkler is designed for bigger lawns and gardens. This sprinkler can be extended to 48” height, works with ½, ¾, and 5/8 hoses. The design and durable built can sprinkle water up to 85’ diameter. If you want a durable option to water the garden, then invest in the SOMMERLAND Heavy Duty Spinning Sprinkler. Made from a solid brass body, this tripod lawn sprinkler dispense water like light rain which wets every section of the garden rather than pooling water in a specific area. SOMMERLAND tripod lawn sprinkler is made of a solid brass body that works in all weather conditions. 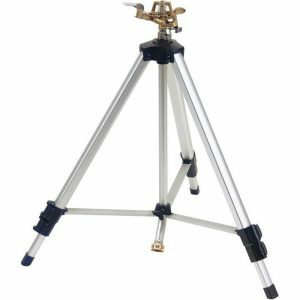 The tripod can be altered from 25″ to 48″ to get maximum coverage of the area. It sprinkles water like light rain. 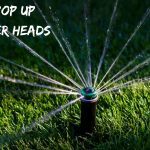 As the tripod sprinklers are tall, portable, and easy to operate, you should use them wisely in your garden, especially if you have a lawn in a large area. Setting up the water pressure appropriately, they can water at long distances in a hefty volume. Every tripod sprinkler comes with an adjustable impact head to set the arc of the spray. Unfold all the legs of the unit outward. Place it on a flat surface of the ground for watering. Attach the garden hose to the inlet port of the sprinkler. Now, push/press the wire trip pin to adjust the arc of the sprinkler. Then stand behind the tripod and slide the left & right arc adjustment to align it. To avoid watering in the areas like driveways and sidewalks, set the tight and left side stops of the tripod sprinkler. In the front of the sprinkler nozzle, you will see a deflector. Adjust it for softening the pressure and reducing the distance. Now, turn off the hose. Lay down the sprinkler on the ground. Loosen the nuts and pull the three legs outwards to throw the water further. To lower the watering distance, do the same procedure but push the legs inwards, instead of outwards. Put the sprinkler in standing position and turn on the hose. Useful tips: Remember that when you turn down the water flow, the distance of watering will also reduce. If the sprinkler arc is less than 3600 and you turn down the wire trip pin, then the sprinkler system will reverse watering direction. This thing will happen when the pin touches the right and left arc adjusters. Following the steps above will help you to get the most out of your tripod sprinkler. You can place your sprinkler at a calculated position and adjust the proper height to cover a significant area with the right amount of water pressure. 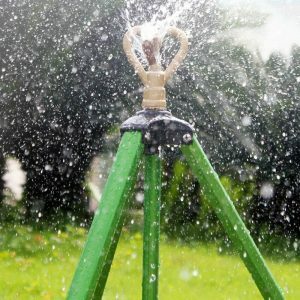 Many modern tripod sprinklers come with different height adjustments of the tripod legs and tilt-able sprinkler heads to water in uneven garden surfaces or hilly yards. 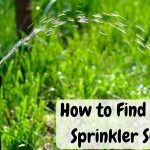 In this article, we tried to cover the sprinklers that works for a small garden too big lawns. Watering the garden can be messy when you have to deal with water puddles. To scatter the water evenly around shrubs, plants and on the lawn, invest in the best tripod sprinkler that works on all type of garden hoses, comes with adjustable height and rotates around 360 degrees. All the above mention product has good customer reviews and chosen because of the sturdy built and characteristics of a worth investing sprinkler.